Please use the Google Maps feature above. Mapquest and other online mapping services have unfortunately misled our guests in the past by using roads that are no longer in existence. Take US 31 to Exit 7, Walton Rd. Turn right and proceed to first light. Turn left at light and proceed until next light. Turn right at that light and proceed to the end of the road. Turn right on Madron Lake Rd. for 300 feet, then turn left on Elm Valley Rd. Proceed west on Elm Valley Rd. 2.1 miles (always stay left) then south (left) on W. Clear Lake Rd. 1/2 mi. Still Waters will be on your left. Take Red Bud until you pass the motorcycle track. Turn right at next corner/Miller Rd. Go 1 ½ miles then turn left on Broceus School Rd. Go 2-3 miles proceeding straight through the stop. Turn right on Elm Valley (about 1/4 mile past stop). Go 2.1 miles, following the center line (at one point it looks as if the road ends. Stay left with the center line and it is still Elm Valley). At 2.1 miles you come to West Clear Lake Rd. Turn left for ½ mile. Still Waters is on the left. Access intersection of US 12 and US 31. (If you are coming from Indiana this will be exit #3 in Michigan.) Travel west on US 12, 3.8 miles from US #31 bypass. Turn north on Bakertown Rd. for one mile to Galien-Buchanan Rd. West on Galien-Buchanan Rd. 2.2 miles to W. Clear Lake Rd., then north 1/2 mi. Take Cleveland Ave. south toward the village of Galien. (11 1/2 miles from the blinker light at the intersection of Stevensville-Baroda Rd. and Cleveland Ave.) Cleveland makes a bend to the right just before entering Galien. Directly in that bend, turn left on Galien-Buchanan Rd. Go 3.3 miles. Turn left on West Clear Lake Rd. Still Waters will be .6 miles on the right. Enter Michigan via I94. Take exit #4, US 12. Proceed east on US12, 10.7 miles to Cleveland Ave. in Galien. Turn left (north) on Cleveland Ave. for 1.1 miles to Galien-Buchanan Rd. Turn right (east) on Galien-Buchanan Rd. 3.3 miles to W. Clear Lake Rd., then left (north) 1/2 miles. Go straight through Buchanan to the end of road. Turn right on Madron Lake Rd. For about 300 feet, then turn left on Elm Valley Rd. Proceed on Elm Valley Rd. 2.1 miles ( in the middle of this it looks as if the road ends, but if you turn left it is still Elm Valley). Turn left on W. Clear Lake Rd. .6 miles. Still Waters is on the left. Travel west on US 12, continuing 3.8 miles past US #31 bypass. Turn right (North) on Bakertown Rd. For one mile to Galien-Buchanan Rd. Turn left (West) on Galien-Buchanan Rd. 2.2 miles to W. Clear Lake Rd. Turn right (North) .6 miles. 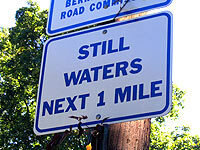 Still Waters will be on your right.